In one swift move the New York Yankees went from being a playoff favorite to a World Series favorite. Thanks to the shrewd and intelligent dealing of General Manager Brian Cashman. The New York Yankees sent prized hitting prospect Jesus Monetero and pitcher Hector Noesi to the Seattle Mariners in exchange for 22-year old pitching phenom Michael Pineda and pitching prospect Jose Campos. The deal was a rare one in this day and age in baseball, where both teams came away as “winners” and dramatically improved obvious weaknesses for their clubs. For the Yankees, Pineda instantly improves a rather suspect rotation that was shrewdly pieced together via free agency scrap-heaping in 2011. Not only does he make the rotation younger and more dangerous, he also solidifies the 2nd spot in the rotation behind ace C.C Sabathia. Now the Yankee rotation has a ton of upside to move forward with and can build a solid future on. Campos brings a solid fastball offering. His FB sits at 91-92Mph, but I saw him find an extra couple ticks to register at 94Mph when looking to put away a hitter. Campos is listed as 6’4” and this helps him to get downward plane on his fastball. His fastball has been described as heavy and I think that is a fair description. Very few hitters are able to square up and drive the ball with any authority. In fact, at the games that I have observed, not many hitters actually got the ball out of the infield. However, the biggest difficulty in attempting to square up on the FB is his ability to locate it. Campos regularly threw his 91-92Mph fastball on the inside part of the plate. This caused a lot of weak grounders or pop ups and indicated that he was getting in on the hands of the hitters. While the velocity of his fastball was impressive, I was more impressed by the fact that Campos could locate the FB where he wanted on a consistent basis. Campos compliments his fastball with a nice slider. While this pitch doesn’t have huge movement, it does a have late breaking action to it. Campos brings his slider from the same arm slot as his FB and the pitch moves to the outer half of the plate against right handers as it breaks. This a great compliment to the FB that he likes to bring in on the hands of right handed batters. The slider sits consistently at 83-84Mph and was highly effective. Campos does have a curveball to go with his other pitches. It is most certainly a work in progress. The Mariners received some offensive pop with the dynamite Jesus Montero who was very impressive in his stint with the Yankees last season. He provides a solid bat behind the plate for the DH spot who has drawn comparisons to Detroit Tigers’ superstar Miguel Cabrera. Montero nearly went to the Mariners in a trade for Cliff Lee in 2010 before the Texas Rangers swooped in at the last moment. Seattle also gets a solid pitcher in Hector Noesi who can fit into the rotation or be a solid fixture in the bullpen. Noesi was rumored to be in the mix for the Yankees rotation this year. For the Yankees, this move made sense. Montero has not been able to prove he is a solid fixture behind the plate, where the Yankees has a surplus of top level talent both in the current roster with Russell Martin and in the minors with prospects like Austin Romine. The DH spot was not a spot the Yankees wanted to fit Montero in for the long-term an with their obvious need for strong pitching, this move made sense on many levels. Bats are not an issue for the Bombers, pitching has been. Pineda who is an imposing presence at 6 foot 7 inches and 250 pounds, pitched like an ace in the first half of the 2011 season for the Mariners. Although he seemed to tail off toward the end of the season he still finished with 173 strikeouts and a 3.74 ERA in 171 innings while holding opponents to a .211 batting average. All sings point to this guy having “ace” stuff and the mentality to go along with it. The deal instantly transforms the Yankee rotation that was pieced together with duct tape and crazy glue by Cashman in 2011 and relied heavily on aged arms Bartolo Colon and Freddy Garcia as well as the weak-minded basketcase A.J Burnett who the Yankees seemingly can’t even give away. Now their rotation is young, imposing and is only going to get better. This is how it may break down in 2012 for the Bombers; CC Sabathia as the ace (31), Michael Pineda (22), Ivan Nova (25), Phil Hughes (25) and newly signed Hiroki Kuroda (36). This also allows the Yankees to fit Freddy Garcia, Bartolo Colon or Aj Burnett (please no) in and out as they please or if Nova regresses or Hughes struggles. 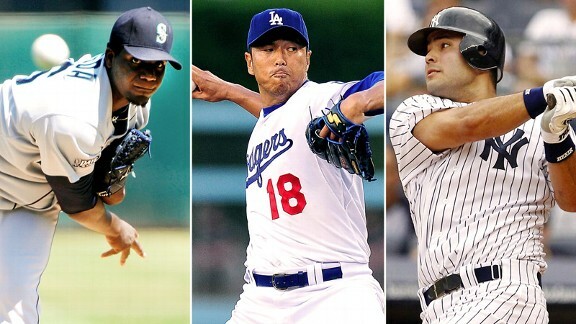 Kuroda has a 3.45 ERA in 699 career innings, all with the Los Angeles Dodgers. Kuroda is an innings-eater and someone who can be a very solid addition to a Yankee rotation. This also was a great deal for Cashman because he didn’t have to give up a ton of his elite farm system to get a solid pitcher. While in negotiations with the Oakland Athletics to acquire left-handed pitcher Gio Gonzalez, the A’s asked the Yankees for Jesus Montero and top pitching prospect Manny Banuelos or Dellin Betances. The Yankees gave up less and got a much better pitcher, with more upside and the type of rare gem that only comes along every so often. The only question now is if Pineda can continue his progression pitching in the bright lights of New York. The best part of this deal is that if any of the Yankee pitchers struggle in 2012, Cashman still has plenty of pieces to seek top-flight help. Or he can make another shrewd deal for a young talented pitcher before spring training. Although I am a huge Jesus Montero fan and was excited to see him in pinstripes again in 2012, I see why this deal was necessary, smart and impossible to pass up. The Yankees have enough run-scoring ability in their lineup to make even the most pedestrian of pitchers look good. With hitting coach Kevin Long who is arguably the best in the business and a return to health for Alex Rodriguez and Derek Jeter it’s hard to argue the Yankees won’t be better in 2012. While the Anaheim Angels may easily boast the best rotation in the AL, it’s going to be interesting to see how the Yankees rotation compares in the 2012. Furthermore, they are supported by the best bullpen in the majors and the best closer of all-time in Mariano Rivera. It’s a good day to be a Yankee fan and a good day to be a Mariners fan too. Will the Orioles end their playoff drought?